We hope that you have a wonderful Easter and are looking forward to the busy term ahead. Our 'topic web' outlining the planned activities for the Summer term can be viewed below. P.E. day for 2B is on a Thursday. PE day for 2O is on a Thursday. Well done to all of Year 2 for your excellent poems. It was such a difficult task to choose our winners! It was lovely to see a wide range of adjectives in your poems!!!!! This term we will be looking closely at the Great Fire of London. Have a look athe video clip to find out about our interesting topic ahead!!! Can you produce a model or a poster to represent the Great fire of London? We look forward to seeing your finished products!!! 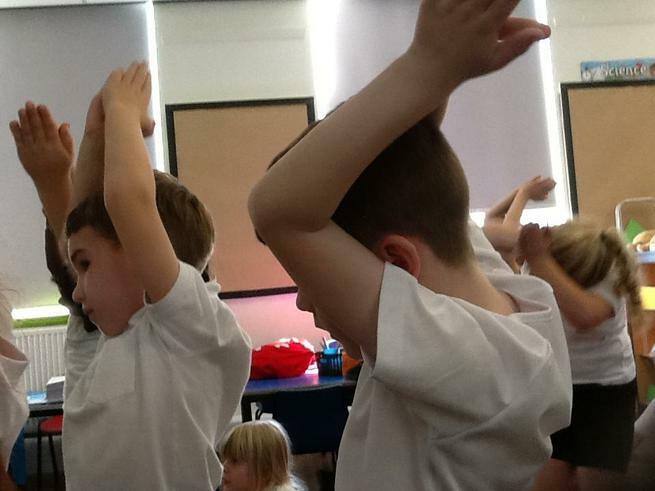 We have had a very exciting week in Year 2. 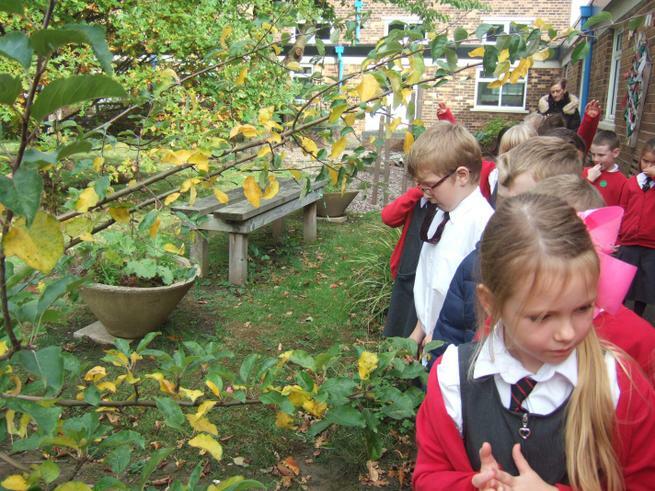 In Science, we went on a senses walk in our school garden. We were able to hear birds, traffic and aeroplanes. 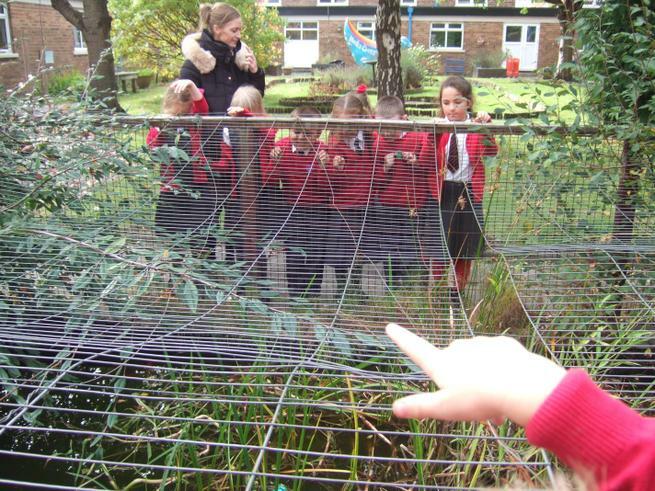 We smelt some flowers and we saw fish in the school pond. There were lots of leaves to touch as well. 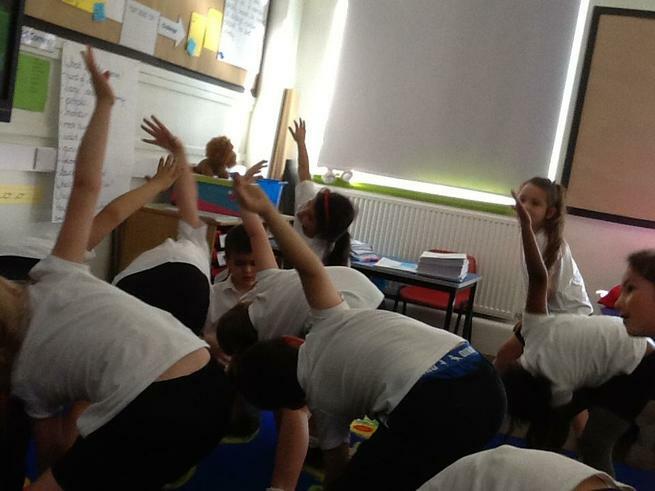 In PE, we has the opportunity of doing some yoga activities, it was hard work, but fun! We have been remembering the 100th anniversary of the First World War. We watched a short video clip about why we wear poppies. We then made some memorial crosses and poppies and took part in a Remembrance assembly. 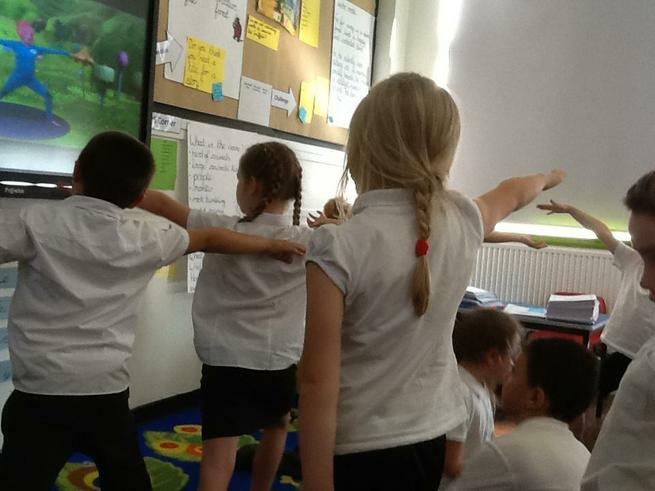 During our PSHE lesson we discussed about war and even enjoyed debating during a P4C lesson. Both classes worked really hard respecting each others viewpoints, well done. Please continue to read your books on bug club. Don't forget that Bug Club is on a Tuesday lunch time for Class 2O and a Wednesday lunch time for Class 2B. We have enjoyed writing poetry, using really interesting adjectives. We have also been writing stories, inspired by the Gorilla book by Anthony Browne. We were able to use conjunctions and time conjunctions. Today in DT, we have been making fruit salad. We have been chopping, grating and mixing. 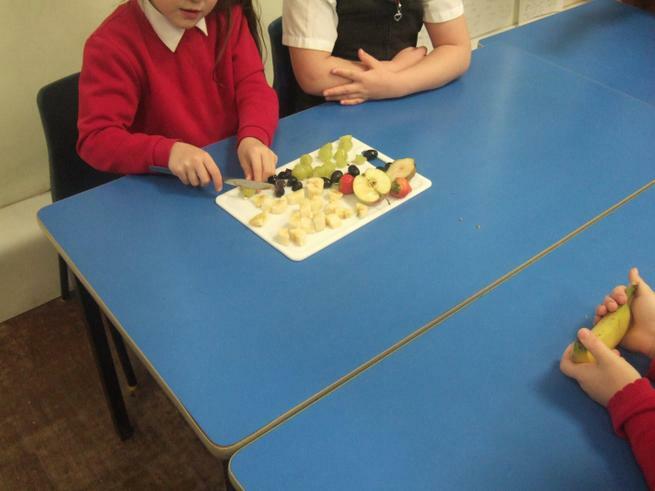 The children enjoyed the fruit salad, even though we had just had our big Christmas Dinner! We had a lovely visit from Father Christmas. We received presents and reindeer food as well as a very healthy breakfast. We have had a fantastic Number Day in Year 2. We played games and then we made our own games. We even got special challenges of Mr Subtraction Man!!! Well done for a great day and thank you for all of your donations for NSPCC. After half term, we will be begin our exciting new topic based on Christopher Columbus. During half term could you research Christopher Columbus and present your work in a creative way, e.g: models of the ships, maps or compasses. Raffle tickets will be rewarded to your hard work. We look forward to viewing your inspirational products. This week, we have discussed 'online safety'. The children discussed the importance of passwords and how we should not give them out to anybody else. The children listened to the steps we need to take if we receive any unkind words or messages online. Fantastic answers and suggestions on what we could do were given by the class. Well done Year Two. Today, we have been writing some instructions on how to play games. We worked in teams and we invented our own games using hoops, beanbags and cones. We then included some adverbs, time conjunctions, conjunctions and imperative verbs in our instruction writing. 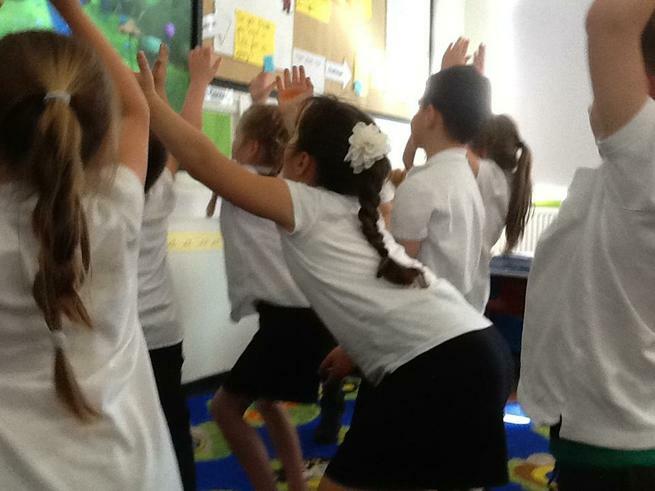 We then had some fun playing our games and checking that our instructions made sense.